Once you realize that pretty much everything around you, no matter how seemingly small and insignificant, has a story behind it, the world becomes much more interesting. 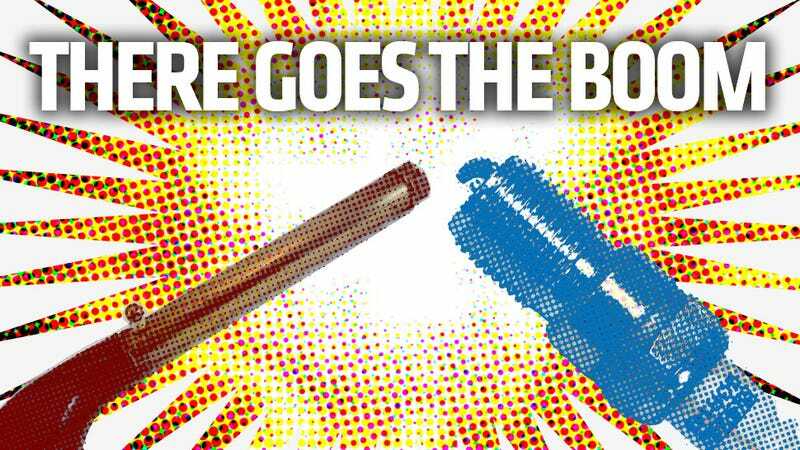 Your car is packed full of parts with good stories behind them (the tragic tale of Sir Nathan Airfilter comes to mind) but the one I'd like to talk about today is for the humble spark plug. Though we now employ them, slave-like, to ignite our fuel hundreds of times a minute, their ancestors were once used to make Victorian-era lecture-goers crap their pantaloons. The spark plug is one of those car parts that you can pretty much guess its function just from its name. It sparks, and it does indeed plug a hole in most engines. A quick primer for those of you who have been so enmeshed in the plugless world of Diesels that you may have forgotten: the spark plug is a small, usually ceramic-insulated device that screws into a hole in the top of an engine's cylinder and creates the electrical spark that explodes the compressed air-and-fuel mixture, which sends the piston flying down, rotating the crankshaft which, though the transaxle system drives the wheels, which lets you do your burnouts in front of the Dairy Queen and from there gets you laid or to work or whatever. It's the money shot-maker of the Otto-cycle engine. So, as the thing that actually makes the explosion happen, the spark plug was absolutely crucial to the development of the internal-combustion engine. And it was born from work that Alessandro Volta was doing in the infancy of man's harnessing of electricity. Volta, whom, you may have guessed, the electrical unit volt is named for, was also the inventor of the voltaic pile, a very early form of battery. The voltaic piles (which aren't his hemorrhoids — those are just Volta's piles) gave him access to electrical current to experiment with, and one of the used he put this current to was the Eudiometer, which was a device that ignited a mixture of hydrogen and air to determine the "goodness" of the air. By "goodness" he meant oxygen quantity, which I think we can all agree does make for some pretty good air. These experiments prompted him to describe building a sort of air gun, where a spark would ignite a flammable mixture. Our on-the-ball readers will note that that sounds a hell of a lot like what a spark plug does. By the 1800s, scientific lecturers were building what they called "Volta's Pistol" — a pistol (or cannon, or bulb) - shaped device that had a cork on one end, was filled with a mix of hydrogen and oxygen in the middle, and an early spark plug progenitor on the other. The proud owner would connect the plug's wires to some form of current — a voltaic pile, Leyden jar, or other early battery — and the plug would spark, exploding the gaseous mixture and launching the cork from the bottle with a huge BANG, which would then wake up all the students or society people nodding off in the auditorium. So, this goofy and likely dangerous little scientific toy had all the elements of the modern spark plug in it. Pressurized cylinder full of explosive gas, with a little inset pair of electrodes to create a spark that jumps across a tiny gap, blowing everything up and causing the force to react against something. In the gun's case, it was the launched cork, in a car engine it's the piston, but the principle is the same. It was a long road from the pistol to the engine, of course, though. But not that long. By 1860, Jean-Joseph-Étienne Lenoir was the first to employ a more real-seeming spark plug (ceramic insulator and everything) in an internal-combustion engine. While we here in the US were nervously circling Civil War, this Belgian was making spark plugs, and we haven't looked back since. So, today, as your plugs fire about 500 times every minute, give a thought to the startled lecture-snoozers that made it all possible.